Last night, I was in a dressing room trying on dresses for my friends wedding, when all of a sudden, I realized that I never want to set foot in a dressing room again. Anyways, here are 5 reasons why I hate dressing rooms and will steer clear of them from here on out. Need I say more!? I will be bathing in L'Oreal self-tanning wipes until further notice. I'm even more sorry that you opened the curtain/door thing thinking no one was in here. Is that someone's dried up gum smushed into the floor from the 90's? 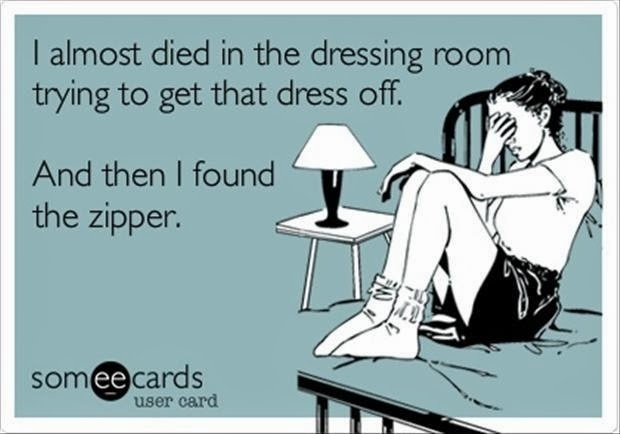 Don't deny it ladies, we've all almost had a wave of panic take over us as we realize that you are stuck in that dress and/or shirt and can't get out. Maybe I'm shopping in the wrong places, but dressing rooms are just not the place for me. I couldn't agree more! I get stressed out trying things on; like I start to sweat, haha. I'd much rather buy the wrong size and have to take it back than try ANYTHING on. Haha funny and so true!! Dressing rooms really are disgusting! From working in retail and hearing stories, knowing the things that go on in them make me never want to be in one again. Yuck.